Educators have now introduced the so called escape-games into their teaching or training practices. During a limited time, a team of learners collaboratively solves puzzles related to educational content. For learners, the aim consists of “escaping” from a room. For educators, an escape-game contextualizes an educational content into a meaningful and inspiring experience based on game-based and collaborative learning. 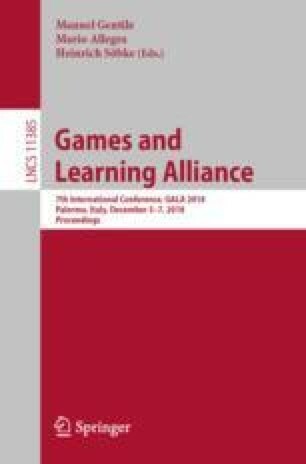 This paper deals with the implementation of what we call educational escape game with the focus on the process dedicated to decontextualize the knowledge after a game session. We want to get a better understanding of debriefing so that practice can improve. The paper is based on an empirical study carried out with teachers/trainers experienced in implementing educational escape games. The paper is organized as follow. We (1) provide with a brief review of literature on debriefing and we argue for the adoption of the term “institutionalization”, a concept enabling to take into consideration the transformation of knowledge after a game session. We (2) propose a definition for educational escape-game based on a literature review and the systematic analysis of 2 French databases of educational escape games and (3) we discuss the results of an empirical work aiming at understanding how educators carry out the debriefing session which follows the time dedicated to play. According to our theoretical framework, debriefing consists of a process aiming at the transformation of the subjective and situated knowledge developed during the game into objective and transferable knowledge. Interviews and questionnaires conducted with three teachers enable to describe this process in terms of time (chronogenesis), role played by participants (topogenesis) and the settings (objects and relationships between objects) in which this process takes place (mesogenesis). These findings offer the opportunity for new guidelines for the design of debriefing sessions.